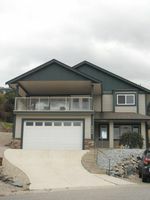 Orchard Ridge Home shows well, Built in 2005 offering 3 Bedrms, Den & 2 Full Bathrms including an ensuite. Fully landscaped, low maintenance yard located in a quiet cul-de-sac that offers lakeviews. Zoned R8 for a legal suite & roughed-in for SUITE includes separate entrance, elect meter & full rough-ins. Professionally built by local craftsman includes features of vaulted ceilings, Gas Fireplace, Island Kitchen, Corner Pantry & oversized double garage. Large covered front deck offers excellent views & private rear yard patio area with concrete retaining walls & stamped concrete. Tons of natural light with oversized windows. Home shows very well, Please allow notice for showing requests as shift worker tenant with children would appreciate it, Otherwise shows very well.